LabStorm: Can Feedback Collection Improve Education Intervention? Fundación Carvajal has been serving the most vulnerable families in the Cali and Buenaventura regions of Colombia since 1961. The family foundation, which functions as an operating foundation, takes a unique approach to intervention, focusing on trust building and opportunity identification before designing a program. They recognize that overcoming generational poverty requires a comprehensive and sustained strategy – which includes the voices of those they’re trying to serve. Carvajal brought one of their most challenging projects to a recent LabStorm: how to support students on the edges of the public education system. With no special evaluation or intake program for students with special needs or exceptional talents, the 149 public schools across the region enroll students of all ability levels. However, they do not have strong pedagogical support systems for the various learning needs that may exist within a single classroom. In many cases, parents are unaware that they have a child with a different learning need, and in most cases, teachers don’t have access to the right resources to fully support an integrated classroom. 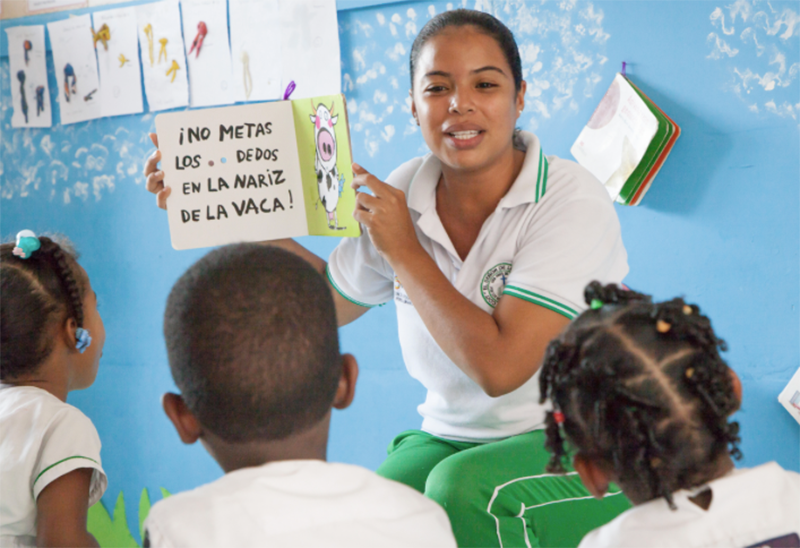 Fundación Carvajal provides various interventions in the form of technical assistance in curriculum development and student evaluation to help teachers and principals more adequately support students with different learning needs, and help them to thrive. In working with 1,250 families across 34 municipalities, they discovered that engaging different stakeholders – parents, teachers, administrators, public officers – at different points throughout the process enhanced their ability to devise appropriate classroom tools and resources. However, collecting and acting on feedback from the target population is a continual work in progress, given that school protocol limits meetings with families to three times per year and that standardized tests often do not accurately reflect the impact of a given academic intervention. Carvajal therefore focused the LabStorm on a brainstorm around a feedback collection mechanism that could more fluidly, frequently, and effectively collect feedback from all stakeholders, and provide insight for improving the interventions developed by the foundation. Students must be heard. Fundación Carvajal has decided not engage directly with students on this project but with teachers, parents, and public officers because the foundation’s aim is to leave installed capacity once the project is over and because it recognizes that the responsibility over the students relies on the families and the school. The LabStorm challenged us to flip this equation on it’s head: what if learning from the students could influence how parents and teachers can best serve their needs? Asking students a question like, “What are your hopes and dreams for the future?” can provide a critical baseline by which to gauge the effectiveness of learning interventions. By understanding what the students are looking forward to, and checking back in throughout the year on how those dreams have been achieved or change, can enable Carvajal to devise the kinds of tools teachers can, and should, be using to serve the students best. Teachers know best. These are the adults that interact with the skills and talents of students on the most regular basis. They know what gets a child truly engaged, and knows exactly where they get stuck. Teachers are best positioned to understand how Carvajal’s program is influencing behavior. With this knowledge, in collaboration with each other, teachers have the potential to provide feedback on the program itself and help move the agenda forward. LabStorm participants suggested that Carvajal create a meeting space for teachers working across their 149 schools to discuss with each other what’s working and what’s not. This community space can lead to more communication and better outcomes. Parents have unparalleled influence. Parents often don’t know that their children are struggling with learning disabilities, or that their behavior problems stem from being bored in class, until after teacher or administrator identifies it in their student. Once a parent does become aware, Carvajal has the ability to play a mediating role by asking parents how they feel, what changes they wanted to see in their child with Carvajal’s intervention, and if their expectations were met. We are excited to learn more from Carvajal as they test out new mechanisms to gather feedback and strategies to engage their various stakeholders. Want to stay involved? Reach out to us at [email protected] if you’d like to learn more from Catalina and her team at Carvajal. Contribute your thoughts below and check back here, on the Feedback Labs Blog, for updates on how we help drive this momentum forward.